It is perfectly natural to breathe through your mouth at certain times, such as when lifting a heavy load or running. Breathing through the mouth most of the time, however, can cause health problems. These problems can be especially severe for children because mouth breathing can affect the long-term development of the face. Air is something that nobody can live without! Most of us bring air into our body through our nose. The nose is designed to act as a natural humidifier and filtering system for the air we breathe. Why we can’t get enough air through our nose, however, the mouth takes over. Breathing through the mouth is perfectly natural occasionally. Yet, breathing through the mouth most of the time was not nature’s intent. When this happens, serious problems can occur. Why Breathe Through the Mouth? Using the mouth for breathing disrupts our natural body mechanics. This would be less of a problem for the animals. Since the heads of four legged animals are horizontal to the ground, gravity helps to bring the throat muscles down and keep the airway open. By standing upright, man creates a new need to maintain the airway. We do so through a complex network of cartilage and muscles in the throat. After air passes through our nostrils, it goes into our pharynx. The pharynx is located just behind the nasal cavity and is the passageway for both food and air. The tongue is the large muscle which does much of the work to keep this passage open, in combination with the soft palate which rests upon it. The lower jaw serves as a support for the tongue and related structures just below the neck. We typically use the jaw and tongue for eating, swallowing and speaking. When used for breathing, we must make postural adjustments. 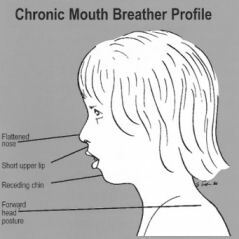 Chronic mouth breathers tend to bring their head forward in front of their shoulders and tilted back to maintain an open airway. Try it yourself, while letting your tongue relax. Notice that this posture pulls the jaw down and back. It also changes the position of the tongue. The tongue is pulled down so that it no longer produces any force against the upper arch of the teeth. Without this force, the developing upper jaw does not fully grow and the nasal cavity becomes constricted. 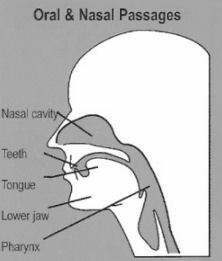 Since the upper jaw also happens to be the lower part of the nasal cavity, you can see how one affects the other, What started out to be a problem with your nose also becomes a problem with your bite. Even worse, when children chronically breathe through their mouth, it can affect the overall growth and development of their face. A typical facial profile is associated with people who have a long history of mouth breathing. It is a narrow face with a forward head posture, a narrowed or flattened nose with nostrils that are small and poorly developed, a short upper lip, and a “pouting” lower lip. If you or your child habitually breathe through the mouth, it is important to be examined by dental or medical professionals who understand, can identify and treat the problem appropriately. Dr. Barron regularly evaluates her patients for these problems as a part of her standard orthodontic examination. If Dr. Barron identifies this problem in her examination, she makes a referral to a physician who understands the health problems that can result.